Welcome to Wednesday and the IWSG posting. 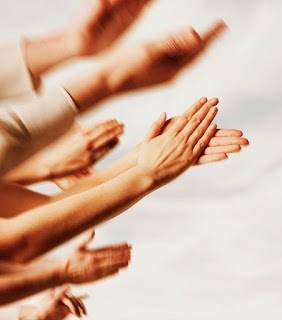 If you'd like, click on the link above to find other great blogs participating this month... I'm co-hosting along with Alex's other awesome co-hosts Elsie, Mark Koopmans, and Joylene Nowell Butler! Please stop by and thank them for their generous time and effort. I have spent the last few days in “withdrawal” mode, meaning that after the blitz of blogging for the A to Z Blogging Challenge this year, I have to wean myself off of the high without losing the high. Sounds crazy I know but I bet that those of you who also participated know exactly what I mean. So, go figure, I signed up to be a co-host for the IWSG this month! I figure I’ll get my “fix” in one shot today. If you participated, I hope you all had a wonderful time on the challenge and learned things you had yet to dream would interest you. I did. I won’t go into how many blogs I “pinned” so I’d have them all in one place, just suffice it to say if I hadn’t I wouldn’t remember where to go to find who. Wonderful words of wisdom about taking time to appreciate your life! Congrats on finishing A to Z! Thanks for co-hosting the IWSG, and I hope that you get some much needed rest. I love your sentiments, Lisa. Sometimes we are all so caught up in the daily routine of life we forget to be thankful for the joy. Thanks for co-hosting IWSG this month. I wasn't able to participate in the A to Z Challenge this year, but I have in years past, so I do understand what you mean. And I know I always need to take more moments to appreciate my life. I had a ton of fun writing. It gave me that jolt I needed. But, what I really loved was connecting with everyone through my other blog. It was a great way for me to get somewhat organized in my writing world. (We'll see, huh?) Good luck today and have fun! Lovely post and great reminder. Great post! Thanks for sharing and for cohosting! This group is awesome! I think today will more than fill the Challenge void for me! We are blessed with the ability to share. Giving of ourselves is the greatest thing we can do. "Withdrawal mode" I can relate. Writing a post every day would kill me, which is why I didn't join the challenge. I'm totally impressed that you did it. Congratulations. And thanks for hosting this month's IWSG. Thanks for co-hosting today, Lisa. I have to congratulate you & everyone who participate in the A to Z Challenge. I really admire you guys. What a project. Best wishes. Yay! It was an amazing challenge...and I'm still catching up on comments from it, but I think the best part was making all the new friends. Here's to friends and bloggies that warm our hearts! I've been in withdrawal mode too, the Challenge was more exhausting this year than I expected. But you are so right, things like the challenge may be stressful at times but ultimately the opportunity to participate and share is such a blessing! I wanted to say too thank you for getting my book The Ghosts of Aquinnah! I replied to your comment on my blog but wanted to say thanks here as well, I really appreciate it. Take care and thanks for co-hosting today! Sweet reminder to show gratitude. I am also coming off the A to Z blogging high. I like writing daily. I like the social part of it, too. So, keep on writing and connecting! It was weird after the challenge. I wasn't quite sure what to do with myself now that I didn't have a bunch of blogs to visit and comment on. 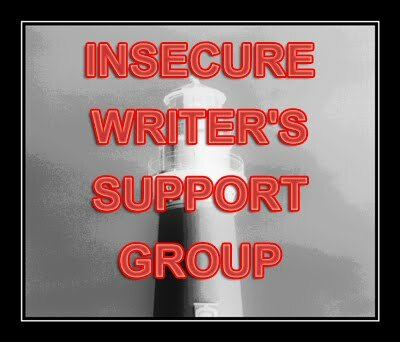 Eventually, I settled into the calm and enjoyed it, knowing there are other blog hops, like IWSG, that will have me running all over the net and visiting people for a day. Your words are so true. 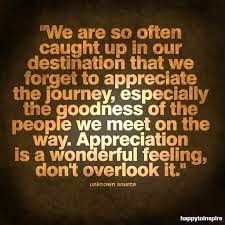 Appreciation is a gift we forget to give ourselves. I pinned your poster. Thanks for hosting. Have fun! I'm highly impressed you do #IWSG and #AtoZ. The latter--way too busy for me! Thanks so much for co-hosting, Lisa. Have a great day. I am in awe of all my efriends who finished that challenge. What a commitment--and a ton of exemplary writing. I completed my first A-Z challenge this year. Made it easy-peasy with photos and notes from our Europe trip. Still was a journey to get through each post but had a great time and met great people. I found out what/where I need to go with a new site to support my current (new) book and a place to house the others that follow. So, content focus was a good outcome for me. But all the great bloggers who participated in A-Z...totally coolest thing ever. Hi Lisa! I'm visiting as a new member of the IWSG, and I'm here to thank you for co-hosting this month. I didn't do the challenge because I have trouble with schedules, hard to stick to. But I'm thinking about next year's ~ even have two possible themes picked out. Thank you for the lovely reminder to appreciate my life! Have a happy day! Wonderful post. It made me physically pause and take a deep breath. When life gets busy for me, I struggle to remind myself to appreciate the small things. I do know what you mean about weaning off the high without loosing it. I love the AtoZ challenge and IWSG. Thanks for co-hosting this month. Thank you for co-hosting IWSG today, Lisa, and for your words of encouragement. I used Pinterest to keep track of all the fun blog sites I visited during the AtoZChallenge also. .
Hi Lisa - thank you for commenting on my blog, and for your advice. 'Mystery'' could also be the market I should consider. I'm afraid I missed the Reflection Day since I felt I needed some days away from the computer at the time. I did feel exhausted, but I also had lots of fun and laughs along the way. The best part was meeting some very special bloggers who I could never forget. Thanks for co-hosting today. Things were coming together for me to participate this year, but perhaps next it. There was tons of creativity across the board. It seems like fun, in a stressful way (I'm so a member of the IWSG). The day after the challenge ended I was gifted with my first grandchild. Definitely taking time off to snuggle and cuddle! I'm delighted that the A to Z is over. Yet, I know how much it meant to you and those involved. That's a positive result. Please try and take a bit more time out. You share with the world in this wondrous diversity. We learn from each other and we learn we can make this world a better place. Wonderful post, Lisa! Thank you for co-hosting today! Thanks so much for co-hosting the group today. I love the idea of pinning your favorite blogs so you know which ones you read and how to find them again. I'll definitely use that idea when I participate next year :) Best of luck with recuperating from the challenge! Thanks for co-hosting today! Very inspirational. Thanks for co-hosting this month! Very inspirational post. I love this! There is always something to be thankful for. Thanks for the inspiration, and thanks for co-hosting today! Coming off the A-Z challenge might give me the bends. I couldn't take the pressure or the decrease in pressure, LOL! But I did give a tip on how to format for ebooks that will save writers money when it comes time to publish. That's all I can take post move, post taxes, and mid-remodel, and still appreciate life around me. Right now, that means taking time to eat the blueberries in our back yard after I feed the chickens and the neighbor's goats, who I think call me, "Maaa-maaa!" Thanks for co-hosting! Thanks for co-hosting today Lisa. You did great in the A-Z. Glad to see you survived! Thanks for hosting IWSG. I was not ready for A-Z this year, but maybe next year. I did do Camp NaNoWriMo in April. I made my word count. I hope I can do it again in July, but I am slow writer. Yikes, you're going to need a break after A-to-Z then co-hosting the IWSG! But I get the withdrawal. A big thank you too, for being such a gracious co-host this month! I really enjoyed your theme and found out all sorts of cool things about France :) Glad the post A to Z didn't burn you out and thank you for co-hosting this month's IWSG! Dyslexia is fun. I initially read your surname as Blue-Collar. I think a lot of people took a few days off after the challenge. It was a whirlwind of activity. It was great to see everyone's posts filling up my newsfeed again when I woke up Wednesday morning!